This kind of food magic only happens when you have a slightly scrungy head of cauliflower in your fridge that you are determined to use up before it goes bad. 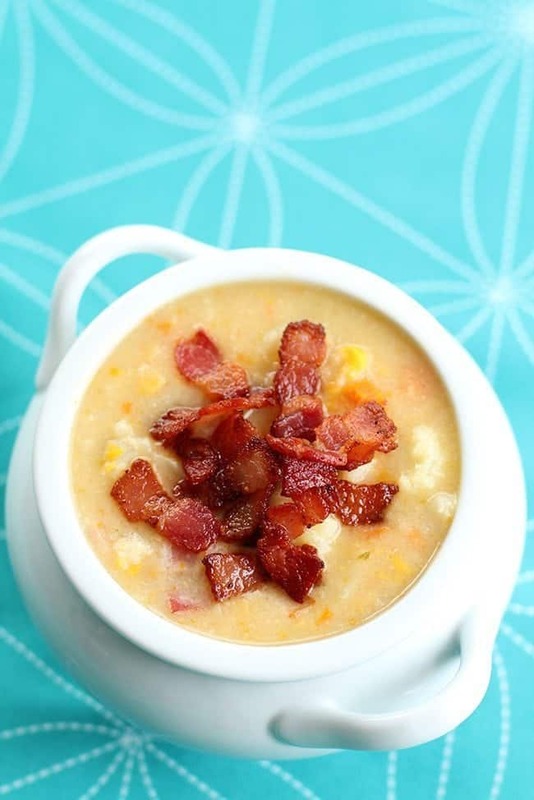 Next time you are looking at that head of cauliflower that is just not quite nice enough to eat raw, don’t be throwing it out, make this absolutely amazing cauliflower, corn and bacon chowder instead! This literally came about because I wanted to use up a head of cauliflower that yes, I left too long in the fridge. I then threw in whatever the heck I could find to go with it, a can of corn, some carrots that I had in the fridge and of course, onion. I did use chicken stock but you can make this a vegetarian version easy, just switch to vegetable stock and leave out the bacon. I warn you, by leaving out the bacon you are losing some major taste. Bacon makes everything better! The beauty of this soup is that you can make it on the stove but I love that it’s a crockpot recipe and it’s actually far better when you make it in the crockpot. 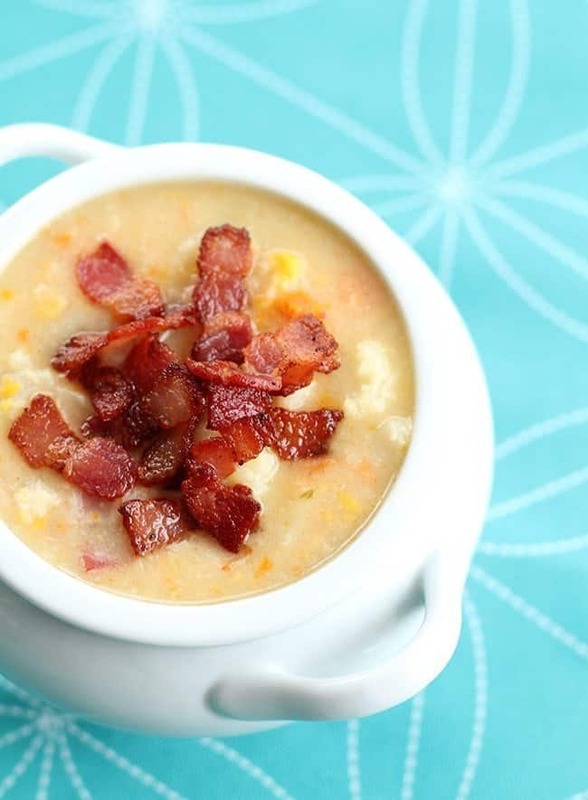 Letting the bacon and vegetables simmer all day long infuses it with a flavor that just can’t be beat. Gratuitous bacon shot. There are sadly too few of these on my website. 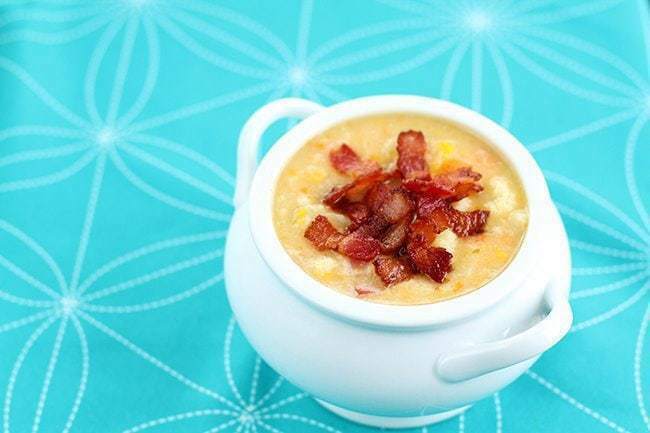 To make it gluten-free, make sure your bacon and broth are gluten-free and then puree some soup at the end and return it to the pot to thicken it. You don’t even miss the flour one smidge! Happy Cooking everyone! You seriously NEED to make this and let me know what you think! 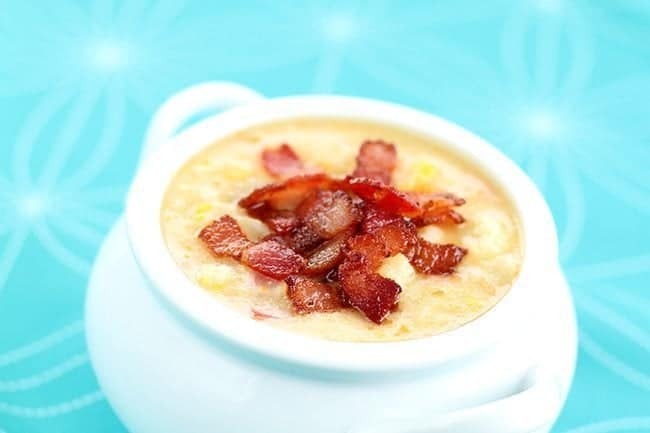 Don’t forget to PIN THIS RECIPE to your SOUPS board and remember to FOLLOW ME ON PINTEREST! Amazing chowder that uses cauliflower instead of potatoes to create a creamy chowder that's not only better for you but absolutely delicious! Fry the bacon and onion in a medium skillet over low heat until the onion is transluscent. Add in the garlic; cook another two minutes. Drain the bacon fat and place into the crockpot. Place the cauliflower, carrots, corn and broth into the crockpot as well. Cook on low for 8-10 hours or on high 4-5 until the cauliflower is completely cooked. Whisk the flour into the cream then whisk into the soup just before serving, Let cook for another 10 minutes. Serve with extra bacon on top.